Oakland Teachers Are Ready to Strike. What's the Beef About? Teachers want better pay, smaller class sizes, and more resources for classrooms and student programs. The district says it supports these goals but also needs to balance its budget. Oakland teachers say they will begin their strike on Thursday, Feb. 21, the union representing them announced Saturday. The decision came after the union rejected the recommendations of a fact-finding report, delivered on Friday by a neutral third party, which offered non-terms for a potential settlement. Oakland teachers have been working without a contract since July 2017. 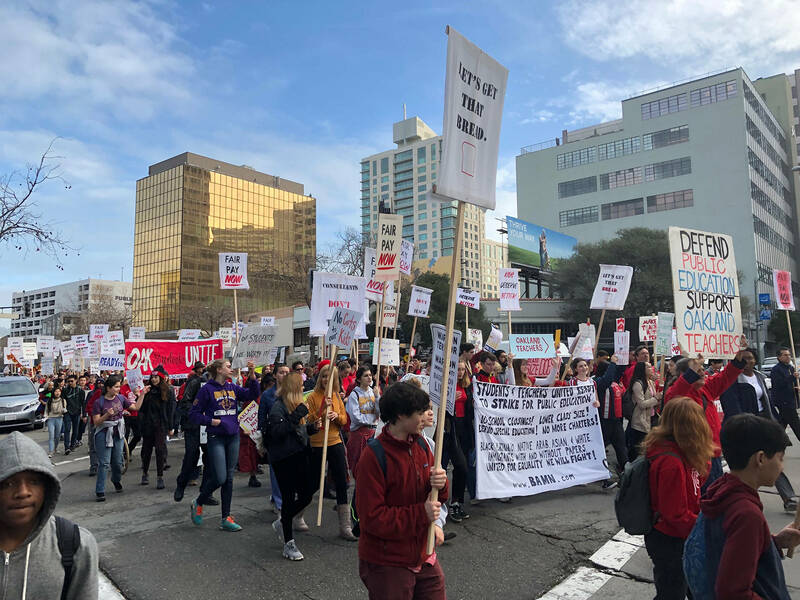 Despite prolonged efforts, the union, which represents some 2,300 teachers, and the Oakland Unified School District have failed to reach an agreement, and the formal negotiation process is nearly exhausted. Meanwhile, frustrated teachers staged their own one-day “sick-outs” in December and January without union approval. What does the fact-finding report recommend? The report, written by Najeeb Khoury, an arbitrator appointed by the state’s Public Employee Relations Board, begins by pointing out the deep flaws in California's school-funding system. "These flaws make finding resolutions to this contract and other teacher contracts throughout the state very difficult,” Khoury writes. The report goes on to note that the district’s offer of a 5 percent salary increase for teachers over three years will not keep pace with inflation. But it also stresses that the union's demand for a 12 percent increase is financially unfeasible for the cash-strapped district. As a compromise, it recommends a 6 percent salary increase retroactive to the 2017-18 school year and calls for new salary negotiations for the 2019-20 school year. The report also recommends a reduction of one student per class, across the board, by 2020. For the neediest 20 percent of schools, that deadline would be 2019. And it suggests reducing the counselor-to-student ratio to a maximum of 1-to-550. Additionally, the report recommends hiring three additional psychologists for the district. And rather than hiring additional nurses, as the union is demanding, it suggests that the union and district work together to fill the district's vacant school nurse positions. What has to happen before a strike can be called? The union and the district are now in the formal fact-finding process, a step legally mandated by state law in collective bargaining negotiations. Late last week, each party made its case before a three-person panel consisting of one member appointed by each party and one neutral member appointed by the Public Employee Relations Board, the state agency charged with administering collective bargaining laws. We're answering your questions about Oakland Schools. It works a little bit like a jury trial. After each party lays out its arguments (you can see OEA’s presentation to the panel here), the neutral panel member writes a report with recommendations for a settlement. The district and union have said they expect to receive the report by February 15. The report then has to be made public within 10 days. If the two sides don’t agree to the fact-finder’s recommendations, the union is likely to call for a strike. If you want to get further in the weeds, you can read the state law that outlines the fact-finding process here. What are teachers asking for, and what’s the district offering? Generally speaking, teachers want more pay, smaller classes and more support staff. They say they’re overworked and considerably underpaid, especially given how expensive it is to live in the Bay Area. It’s a key reason, they note (and the district agrees), why the teacher retention rate in Oakland is substantially lower than average as compared with other urban districts nationwide. Specifically, the union is demanding a 12 percent salary increase over three years and graduated class-size reductions over the next two years. It also wants much deeper class-size reductions in schools where 75 percent or more of students are low-income, foster youth, homeless or English learners, as well as slimmer caseloads for support staff like nurses, counselors and therapists. There’s a pretty sizeable gulf, though, between the union’s demands and what the district has put on the table. The district says it recognizes and supports an increase in teacher compensation, especially in the costly Bay Area, but also stresses the tenuous financial situation it’s currently in. The district is shouldering a roughly $30 million budget deficit, which it has to significantly reduce to avoid being taken over by the state (again). As part of an urgent cost-cutting strategy, the district recently proposed closing and consolidating up to 24 of its 87 school sites, a plan that’s proven highly controversial. The district’s offer is a salary increase of 5 percent over three years and marginal class-size cuts, but only for fourth and fifth grades, physical education and fine arts classes. It’s also offering a special education class size cap of 15 students per teacher. Under the current contract, core high school classes like math and English are capped at 32 students (unless a teacher has fewer students in other periods). For kindergarten, the maximum is 27 students. To see where other class size caps and staff-to-student-ratio caps stand, check out the current contract. What about the proposal to close schools? Additionally, the union has asked to bargain around school closures. An attorney with the California Teachers Association, the state teachers’ union, sent OUSD Superintendent Kyla Johnson-Trammell a letter demanding that the issue of closures be brought to the bargaining table. But OUSD Board President Aimee Eng said the district does not believe the issue of closures is within the scope of negotiations and has referred the matter to legal counsel. How do OUSD teacher salaries compare to other districts? Oakland teachers are among the lowest paid in the Bay Area, even when taking benefits into account, according to an analysis by School Services of California, a consulting firm. Although the starting OUSD teacher salary of $46,570 is roughly equivalent to starting salaries in most other large Bay Area districts, the average teacher salary in Oakland ($63,149) is notably lower, as is the highest-paid salary ($83,724). In San Francisco, by contrast, the average teacher salary for the 2017-18 school year was more than $73,00, with top-earners making more than $96,000. In San Jose, teachers on average made just over $79,000, with some of the highest paid making as much as $97,000. What would it cost the district to meet the union’s demands? OUSD Superintendent Kyla Johnson-Trammell has said each 1 percent raise that teachers get means an additional $1.9 million per year in costs to the district. Factoring in all district staff represented by the union — teachers, counselors, nurses, psychologists, speech therapists, etc. — she said those costs go up to about $3.5 million per year for each 1 percent raise. By that metric, the 12 percent raise the union is asking for over three years would cost the district $42 million. The district has said Measure G1 funding will provide $5 million annually to help pay for salary increases. When did Oakland teachers last go on strike? What happened? Oakland teachers walked out in 2010 for one day. According to news reports at the time, the district imposed a contract after exhausting the negotiation process. Teachers then had been working without a contract since summer of 2008 and the issues were similar: pay, class size, lack of support staff. Teachers were asking for a 15 percent pay increase over three years. The district, which faced an $85 million shortfall at the time, according to the San Francisco Chronicle, put forward a pay cut initially, citing its deficit. About 90 percent of teachers joined the strike, according to the media reports, and some 300 emergency substitutes, administrators, non-union staff and volunteers oversaw classes. Teachers who participated reportedly lost one day’s pay. Meanwhile, some 600 students spent the day at the Grand Lake Theatre enjoying a double feature and free popcorn, courtesy of theater owner Allen Michaan, who put the show together in support of the strike. In 1996, teachers went on strike for 26 days.